Being my usual moronic self I forget to throw my belt in the suitcase and found myself trying to pull luggage through Tampa airport while holding up my britches. So off we went in the morning to find a store that sells fat dude belts. On the way to the store we passed this odd looking cabin on the side of the road with a few picnic tables out front. The sign proclaimed Ted Peters Famous Smoked Fish and instantly forgetting that we had to drive half an hour to find a belt that would fit me, I announced we gotta go there…I mean it’s famous. Guess I’ll have to buy a bigger belt. Little did I know it is famous, when we arrived the server told us they had been on the Food Network although she couldn’t remember Guy Fieri’s name. 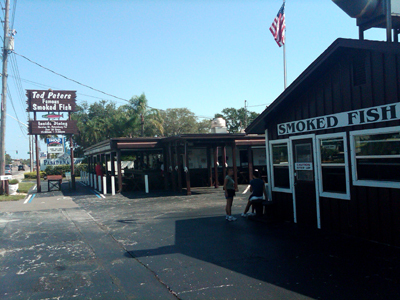 Just off the road there is a smoke house, some picnic tables, a bar, and somewhere there is some inside seating. The service is a little gruff but that seems to fit the locale. You are a few feet from the cars racing down the road sitting at a picnic table but all of that goes away when plates start hitting the table. We started with a cup of clam chowder, the first Manhattan version I had seen in St Pete. 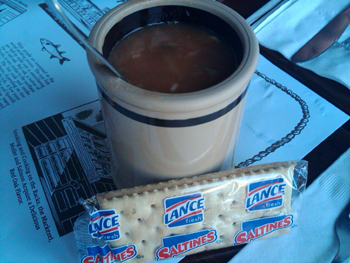 The soup was really good, my Mom who is not a fan of the East Coast version said it was the first one she had enjoyed. The service might have been gruff but they did quickly go out of their way to accommodate us. My Aunt hadn’t been feeling particularly well and a big plate of smoky fish didn’t sound particularly good and is essentially the menu. 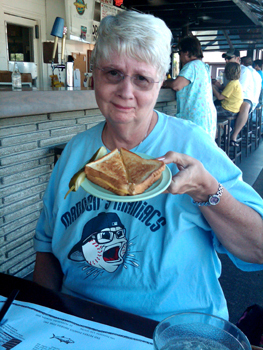 The server made a special request to the kitchen and they happily brewed up a grilled cheese so she could share the meal, although when you see the picture I think she would have liked to join in smoky goodness. We ordered the fish spread…yes fish spread, smoked mackerel, and the cheeseburger. Why the cheeseburger, well, our server said it was really good. 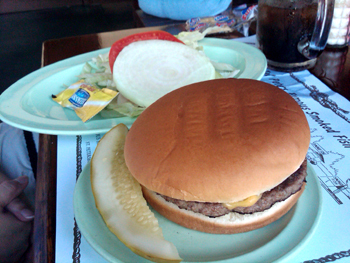 The cheeseburger is frighteningly simple. Soft bun, burger patty, and wait for it…Velveeta. The server was right however, it was really good, simplicity at it’s best. My smoked Mackerel was stunningly good. A dark smoky pellicle is cast over moist and delicious fish which is served with two horseradish sauces, a standard and a peppered variety which proved to add a great zing to already delectable dish. 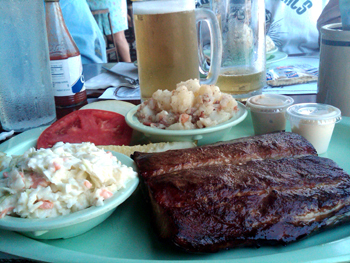 Next to the fish sits a tomato slice, pickle, coleslaw, and potato salad. The coleslaw, apparently the official side dish of South Florida, had a bright and sweet but tangy dressing and helped counterbalance the rich fish. The potato salad is of the German stripe with a vinegar base and loaded with bacon. The whole plate has years of experience and expertise that clearly shine through in wonderful ways. Now the fish spread, when the server mentioned it I thought she said fish bread and got a little confused. It sounded good enough for my Mom to order and I am glad she did. Served with a row of crackers and a bottle of hot sauce. Oh My Dear Sweet God is this stuff good. 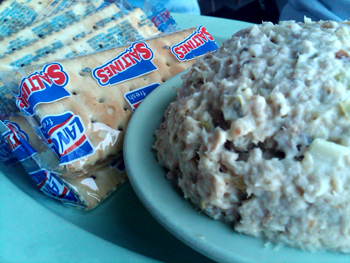 Smoky (in a really good way), fishy (in a really great way), with notes of vegetable and mayo that make any tuna or ham spread I have tasted wail and gnash teeth suddenly aware of its inferiority. 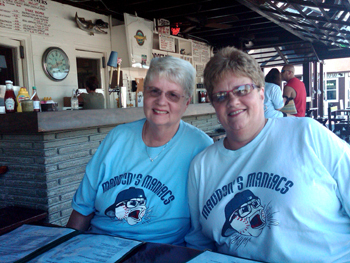 We ended with Key Lime Pie that would have been fabulous had we not just experienced the pie at Dockside Dave's. 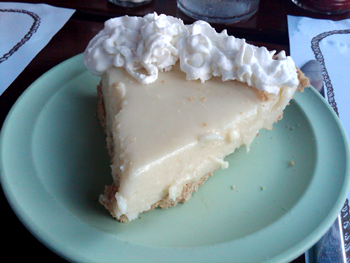 By comparison the pie here is somewhat ham-fisted super sweet and a key lime tang that will cross your eyes. Some things are famous just because they are famous (just change the channel to the E! network for examples) and others have earned it. Ted Peters who will smoke your catch or serve you their own has earned their notoriety and business.